When most people think about sports-related injuries, the first sports that typically come to mind are collision sports such as football, or ice hockey. However, many sports are considered contact sports, and carry with them a significant risk of injury. These include sports like soccer, baseball, and – you guessed it—basketball. 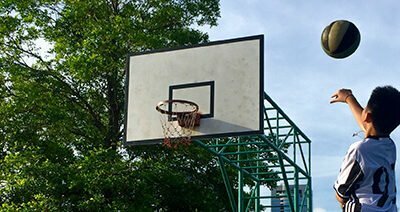 According to the U.S. Consumer Product Safety Commission, more than 501,000 basketball-related injuries were treated in hospital emergency rooms in 2009. In addition, a study published in 2010 that was conducted over the course of 17 years and 1,094 players, professional athletes in the NBA experience a high rate of game-related injuries. Patellofemoral inflammation—inflammation that is the result of worn-down, softened or roughened cartilage under the kneecap—was the most significant injury in terms of days lost in competition. 22 percent of all male basketball players sustained at least one time-loss injury each year. What are some other common basketball injuries? Due to the fast-paced nature of the sport, the majority of the injuries incurred while playing basketball involve the foot, ankle or knee. There’s also a risk of jammed fingers and stress fractures occurring in the lower leg and foot. What are some ways to prevent injuries? Stay fit. Players should maintain a regular exercise routine—both on and off season—that incorporates flexibility training, strength training and aerobic exercise. Warm the body up. It’s always a good idea to take time to stretch and warm the body up before any extended physical activity to avoid injury. Players can warm up with activities such as jumping jacks or running/walking in place for two to five minutes. After that, slow stretching is recommended, holding each position for at least 30 seconds before moving on. Don’t forget technique. Players should remember to only use proper techniques for passing and scoring. Not doing so may result in self-injury or injury involving another player. Wear and maintain appropriate equipment. Players should choose sneakers that fit snuggly, offer support for the foot and have non-slip soles. Mouth guards should also be worn to protect the teeth and head from injury as well as safety glasses or glass guards to protect those with glasses. Avoid overuse injuries. Overuse injuries are becoming more common, especially in younger athletes. Players should not be allowed to play one sport all year long and should be limited to how many teams they can play on within a season. If sports-related injuries do occur, our physicians at Northeast Orthopedics and Sports Medicine (NEOSM) have years of experience in effectively treating all orthopedic conditions. Our multidisciplinary approach to care ensures that patients receive the customized treatment they need to get back in the game. With the winter season comes a bevy of activities to get the blood flowing. Skiing, snowboarding, ice hockey and even just having a snowball fight are all unique to the colder months. With those activities can also come painful injuries, many of which can be prevented by taking necessary precautions and preparations. With such a large number of injuries, it’s important to consider ways of preparing and preventing misfortune from happening during the only time of year in which these modes of having fun are available. Avoid activity when experiencing pain or exhaustionRest is essential to healing, and if a person is experiencing soreness or minor injury, it’s crucial to let the body recover. Be sure all equipment is functioning properly (i.e. helmets, pads, ski boots etc. )Malfunctioning equipment can lead to very serious injury. Be sure to double-check any equipment being used before starting an activity. Drink water and stay hydrated before, during and after activityStaying hydrated is always important, but doing so while being active is essential. Cold weather can often cause people to not consider drinking water, but it is just as vital during winter as during exercise in any other season. Keep exercising throughout the year to maintain good physical healthBy keeping the body conditioned, colder weather, along with tighter muscles and stress on joints, won’t be as likely to cause injuries. Stay aware of weather conditions and severe coldKnowing upcoming weather patterns is important during the winter, as snow/ice storms can lead to hypothermia and extreme frostbite. 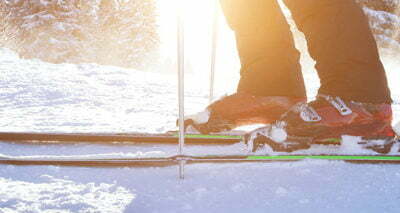 Take ski or snowboard lessons if necessary, as proper form and safety can be the difference in preventing injury while on the slopes.By taking lessons from a trained instructor, you can gain better understanding of form and the correct way of going about activities on the slopes and/or the mountains. Knowing proper form significantly reduces the chances of injury. Wear layered clothing; dressing for warmth should include a heavy top layer with progressively lighter layers underneath.By dressing in layers, you have the ability to avoid becoming overheated when weather and activity increases body heat, and to also bundle up when temperatures get cooler. Warm up before participating in activities by stretching and doing light exercise.By stretching and doing some light exercise before winter sports, it’s far less likely that you will experience a sprain, strain or tear. When the muscles become more tense in response to colder conditions, it’s very important to keep blood flow circulating in order to prevent injury. By being aware of ways in which you can prevent injury from winter sports, it can be easy to enjoy all that the season has to offer. Taking just a few minutes to prepare and make sure proper precautions are in place is the best way to stay healthy, and avoid having to take time off from the countless activities that the season has to offer. The better you’re seen, the less likely you’ll be struck by a vehicle. Use reflective wear and lights when riding during dawn, dusk or at night. Wearing a helmet significantly reduces the risk of severe head injury in the event of an accident. Always be aware of your surroundings and keep a lookout for obstacles that may be in your path. Keep your head forward (try not to look down) to improve your reaction time to anything that may be in your way. Drivers are most accustomed to the patterns of other drivers. Ride as if you were driving a car (e.g., check for traffic, be aware of the drivers around you, etc.). Do not weave in and out of traffic. Obey all traffic laws and lights. Always bike in the same direction as the car traffic. Never ride against it. 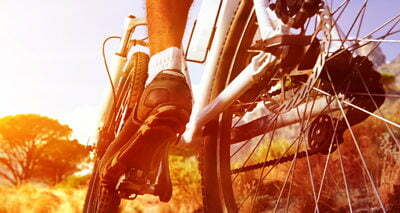 Before any ride, ensure that your bike is comfortable and in good working condition. Check your brakes and your wheels. Make sure your bike and seat are appropriately adjusted for your height (to avoid distracting discomfort). For longer (or bumpier) rides, make sure to wear padded bicycle shorts and padded riding gloves to reduce the risk of painful nerve compression. Use hand signals to indicate to drivers and other cyclists what direction you’re headed. Be sure to make eye contact with drivers; do not assume they have seen you and will stop. Look out for rough, uneven patches of road or slick surfaces to avoid losing control of the bike. If you see a questionable surface, slow down or walk the bike across. By sticking to these tips, you can be sure that your next bike ride will be a fun and safe experience. Our very own Dr. Cheryl Rubin of Northeast Orthopedics and Sports Medicine (NEOSM) recently completed the Pan-Mass Challenge (PMC) to benefit the Dana-Farber Cancer Institute. The PMC is a two-day bike-a-thon that runs through 46 towns across Massachusetts to raise money for cancer research. At NEOSM, our team of orthopedic physicians specializes in all aspects of sports medicine, including comprehensive diagnosis, treatment and preventive care of sports-related injuries. As a practice, we are committed to utilizing the latest advancements to ensure patients receive the highest quality of care possible.